Come 2019 and the nine-metre Flipflopi dhow made of 10 tonnes of recycled plastic will sail to Zanzibar as part of the Clean Seas initiative—a UN Environment campaign—to spread awareness along a coastline swamped by plastics. For Zanzibar, a semi-autonomous archipelago off the coast of Tanzania in East Africa famous for its historic forts and pristine beaches, the timing of the ship’s arrival coincides with its efforts to tackle the ever-growing plastic menace. Zanzibar had earned the sobriquet, “blue island”, due to the high visibility of blue polythene bags prior to 2009. This was also the time when tourism was emerging as an important revenue-earning sector. To cash in on the high tourist flow, the island became the first place in East Africa to ban blue plastic carry bags the same year. However, it did not solve the problem as usage of white ones increased. So, the Department of Environment (DOE), Zanzibar, announced a full ban in 2011, which was revised this year. The new ban imposes fines, ranging from US $21.84 to $437, and a minimum one-month imprisonment on defaulters. “The good thing is market inspections are happening frequently now and defaulters are being fined,” says Farhat Mbarouk, DOE director. The move comes at a time when Tanzania is determined to conserve its environment as well as safeguard the tourist industry, the backbone of its booming economy. Zanzibar, home to UNESCO world heritage site, Stone Town on Unguja (one of the two major islands), witnesses 0.3-0.4 million tourists each year with an average stay of about eight days. Close to 27 per cent of the island’s GDP and 70 per cent of its foreign earnings depends on tourism. A morning walk in Forodhani Park in Stone Town, witnesses all the litter from the night market that is held almost every day- huge quantities of plastic packets, bottles, plastic cups and plates. Similar scenes are witnessed in the Darajani marketplace and other sites on the island. ‘Plastic and packaging are everywhere, on the beaches, in the sea, on the roadside, in the parks and gardens’, says Mzee Khamis Juma, Head Town Planning and Construction, Zanzibar Urban Municipal Council (ZUMC). Clearly, Zanzibar is witnessing the downside of tourism with visitors causing huge environmental damage. Though a survey conducted by the Royal Institute of Technology in Sweden in 2013 says that four out of five tourists considered not returning to Zanzibar due to plastic pollution, data speaks a different story. In 2014-2016, there was a 28 per cent rise in tourist footfall. “Tourist numbers have definitely gone up. It is ironical that visitors often complain about plastic pollution without even realising they add on to the waste directly or indirectly,” says Ashwim Krishnamoorthy, a hotel manager. In Zanzibar, tourists produce 21 per cent more waste compared to locals. The waste produced ranges anywhere between 1.5-2 kg per tourist each day on an average while in Vietnam or Hawaii, the figure ranges from 0.9 per kg per tourist each day in guest houses to 3 kg per tourist each day in five-star hotels, says a report on solid waste management strategy for Zanzibar published in June 2018. 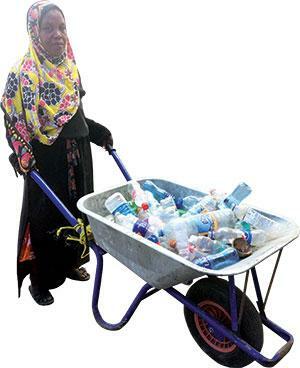 Sheha Mjaja, director general of the Zanzibar Environmental Management Authority (ZEMA) says that the archipelago cannot succeed in its plastic reduction mission without the support of tourists as well as locals. Sensitising tourists is important as they are the biggest polluters in terms of buying and consuming plastic water bottles and fanciful bathroom toiletries, Mjaja says. Currently, Zanzibar has no system of waste segregation at source apart from a pilot site at Shaurimoyo, 2 km from Stone Town, which caters to only 200 households. The initiative was launched in 2017 by the Delhi-based non-profit, Centre for Science and Environment (CSE), ZUMC and ZEMA. Shaurimoyo generates 360-400 kg of dry waste each month, of which 80 per cent is plastic. Here, biodegradable waste is turned into compost while plastics like PET bottles and high-density polyethylene (HDPE) are sold to informal collectors at US $0.066-0.087 per kg. Remaining plastics from all across the island like cutlery and multi-layered packets are either dumped or burnt at Kibele, a dump site 25 km from Shaurimoyo, or dumped in the ocean. This huge amount of waste is managed by only two centres—SB Recycler Plant based in Fuoni on the outskirts of Zanzibar city and Rizik Recyclers in Mtoni, situated in the fringe area—where plastics are converted into pellets before being sent to India, China and Thailand for recycling. Like any other island, Zanzibar is environmentally fragile. Thus, it is vital to develop appropriate plastic waste management systems here. “There is a need to scale up segregation on the island. We have plans to replicate the Shaurimoyo project in other areas,” Mjaja explains. Another major concern is plastics that wash up on Zanzibar’s shores. During a beach clean-up campaign on the World Environment Day on June 5 this year, 300 kg waste was collected. Zanzibar falls on a major route for plastic bags headed for East African countries. More than 200 tonnes of such bags pass through its ports every month, some of which make their way into the island despite the ban. Right now, the biggest challenge is the lack of data on how much plastic is produced, imported and utilised here. “To tackle plastic waste, Zanzibar should explore alternatives while regulating the use of non-recyclable plastics,” says Swati Singh Sambyal, programme manager, solid waste management, CSE. In the end, all countries need to restrict plastic use to ensure Zanzibar’s shores remain clean. (This article was first published in the 1-15th November issue of Down To Earth under the headline 'Drowning in waste').